Keep Fido warm with a gorgeous, soft sweater (C, $60 to $75, www.lovemybutternut.com) from Butternut. With a variety of styles and patterns to choose from, they’re simple, adorable and iconic. Pet lovers will also love the new manual written for dogs by a dog, “Training People: How to Bring out the Best in Your Human” (A, $14.95, www.chroniclebooks.com). The definitive guide for dogs is an indispensable reference guide with advice on food, grooming, service and support. Give your dog some bling with the Aspen Gold genuine leather dog collar featuring imported crystals (E, $22.99 to $35.99, major pet supply retailers). This is the perfect gift for haute, high-rolling doggies. Keep pets clean and smelling great with Mrs. Meyer’s Clean Day Oatmeal Pet Shampoo and Room Freshener Spray (B, Shampoo: $7.99; Spray: $5.99, www.mrsmeyers.com). The products are all-natural, aromatherapeutic and biodegradable. Keep active pets happy with the fun and safe-flying Soft Bite Floppy Disc (D, $12.99 to 19.99, major pet supply retailers), available in three sizes. The Go Get It! retractable ball launcher by Booda (F, $11.99, major pet supply retailers) comes with a mint-flavored ball. The compact ball thrower is ergonomic and eliminates the need to touch a wet, slobbery ball. Article published in The San Fransisco Chronicle’s “Holiday Gift Guide” custom publication on December 5, 2007. 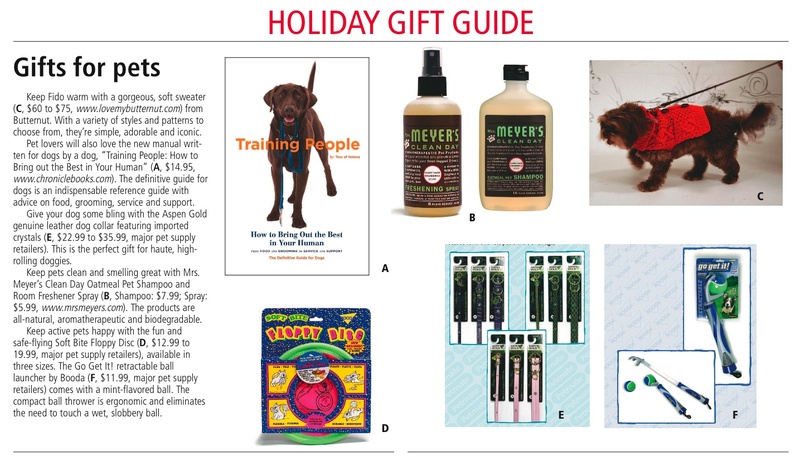 Download PDF of original article “Gifts for pets” to view full layout with PHOTOS!